At A & C Products we pride ourselves in the new standard of window shade excellence and the manufacturing of innovative quality products. Our company has a committment to continuous improvement so our products consistently meet the needs of our customers and comply with FAA/ISO regulations and requirements. 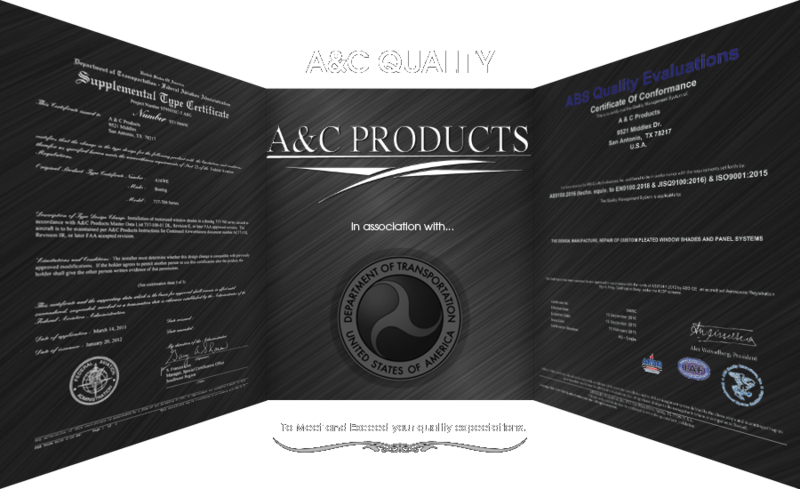 A & C Products is dedicated to being the best in product quality and customer service. 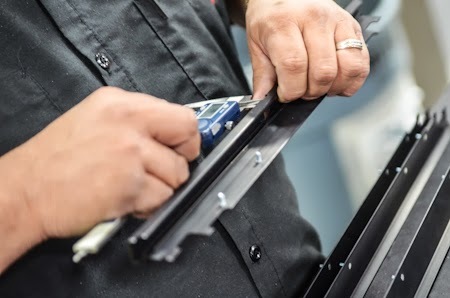 A & C Products is recognized amongst several airframers as a leading aircraft shade manufacturer with a model quality system for others in aviation to follow. A & C has several quality systems that it operates under for various quality requirements. A & C is AS 9100 Rev. C and ISO 9001:2008 approved for Design, Manufacture, and Repair of Custom Window Shades. 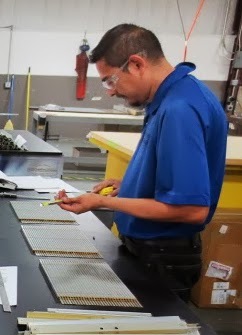 As part of the AS 9100 and ISO 9001 A & C conducts monthly audits and inspections to ensure a rigorous quality system. We have regular scheduled audits to maintain current status for our registration. A & C Products is a Production Approval Holder, or PAH, in compliance with 14 CFR Part 21.137 from the FAA and is audited annually to maintain this approval. A & C Products has attained several STC and PMAs throughout the years. This gives A & C the ability to issue 8130-3 Airworthiness Approval Tags for "new" parts manufactured under the appropriate PMA. A & C Products has tested to meet and exceed the qualifications required by the RTCA D.O.160. The stringent test reproduces Environmental Conditions and measures the reactions of the aircraft window shades. This assessment verified the extremities of environmental and electrical conditions. The results of the test provide confidence in the performance of the product. All parts of the window shades are burn tested in accordance with FAA 14 CFR Part 25.853; results are available for every ship set upon request. A & C Products has maintained a long term relationship with a local Burn Lab and is able to respond to additional customer requests in a timely manner with the assistance of that lab. A & C Products R & D Departments makes certain that prior to the use of any new material, the new material is tested according to standard procedures and a result of “passed” is received.